Your Cat is Doing Well, But How Are You? Cat diabetes is characterized by a decreased production of insulin, as well as a poor response to insulin by their body. 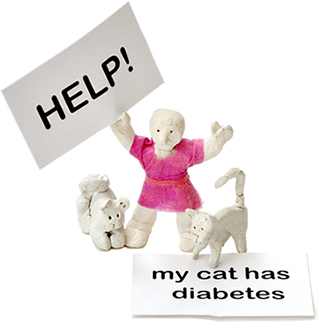 Dealing with a diabetic cat can be challenging and stressful. Feline diabetes symptoms can be difficult to manage; you’ll be faced with your feline friend’s increased thirst, increased urination, increased risk of urinary tract infections, and weight loss, as well as the need to give him regular insulin injections. Most cats adapt very well, but the impact of diabetic cat care on the owner’s quality of life can be significant. Interestingly, most of these negative issues were associated with the owner’s quality of life and not those of the cat. Issues related to the giving of insulin or the symptoms of diabetes weren’t in the top 10 of negatively impacting items. 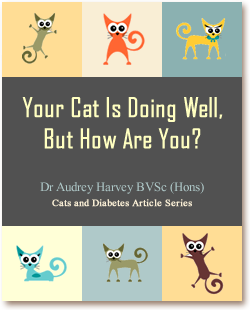 Ironically, 94% of owners responded that their diabetic cat’s quality of life was at least ‘as good as it could possibly be’, ‘good’, or ‘fairly good’. Only 8% of owners said their cat’s life would be ‘a great deal better’ without diabetes. When asked, ‘Do you feel you have a more special bond with your pet now?’ over 45% of owners responded ‘All the time’, and 42% said this issue was ‘Very important’. Owners also responded positively when asked if they were ‘more inclined to play more’ with their diabetic cat, and also to ‘Do you ever give your pet extra things, like snacks, treats, or extra attention because of the diabetes?’ When asked, ‘In the unfortunate event that another one of your pets were to get diabetes, would you treat this pet with insulin too?’, 90% reported ‘without a doubt’. It appears that the increased attention and treats that many owners give their cats offsets the negative aspects of the diabetes for the cat’s quality of life. However, this study really illustrates the importance of considering the owner’s quality of life, as well as that of the cat, when providing diabetic cat care.